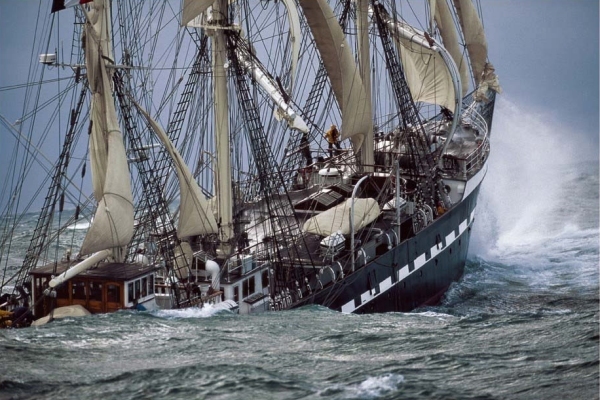 The French barque Belem is en route to Dublin with 60,000 bottles of wine in her hold. 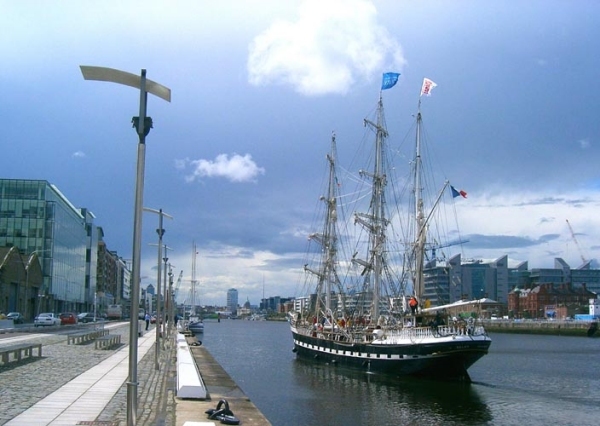 The 112 year old tall ship was originally launched to carry chocolate from Brazil to France. MONTPELLIER, France, 24 February (AFP) — The first cargo of wine shipped from France by sail since the late 1800s will arrive in Ireland from the southern Languedoc region next month, saving an estimated 140 grams (4.9 ounces) of carbon per bottle, compared to a regular shipment. “My idea at the beginning was to do something for the planet and something for the wines of Languedoc,” said Frederic Albert, founder of the shipping company, Compagnie de Transport Maritime a la Voile, CTMV. “One of my grandfathers was a winemaker and one was a sailor,” said Albert who worked in a wine shop in Dublin for four years before moving back to the Languedoc to put his ideas in place. Fifty Languedoc wine producers have now been chosen to supply wines, and Albert says he has a waiting list of about 200 others. “We chose the best wine in the area, but it must also be made in a sustainable way, using as many natural products as possible,” he said. The ship itself, the first of seven planned to be working by 2013, is the 52-metre (170-feet) three-masted barque Belem, the last French merchant sailing vessel to be built. Launched in 1896, its job was to bring chocolate from Belem, in Brazil, to France. The wines will be delivered to Bordeaux by barge using the Canal du Midi and Canal du Garonne that run across southern France from Sete in the east, via Beziers in the Languedoc, where the wines will be collected. The first shipment planned for Dublin currently amounts to about 60,000 bottles, and each bottle carries a label with a stylised ship logo and the slogan, “Carried by sailing ship, a better deal for the planet”. CTMVs second boat, which cost six million euros (8.4 million dollars) to build and is as yet unnamed, will also be launched in March this year. It will measure 52 metres and have 1,000 square metres of sails and a top speed of 14 knots. With a total of seven ships the investment in the project looks set to be about 40 to 50 million euros. Albert would not confirm the exact investment figure, but said he now has seven private investors and the financing is 70 percent private capital and 30 percent bank loans. “There is a lot of interest in green investments in France,” he said. The greenness of the project does not stop with the delivery of the wines. The ship will bring back to France an equivalent tonnage of crushed glass for recycling into wine bottles at two factories, one in Bordeaux and one in Beziers. This should mean cheaper bottles and better supply given the current problems some producers are having trying to get enough bottles. Another plan, to collect the used bottles, may also emerge, but at the moment the logistics are complicated, Albert said. Future ports of call, with Bordeaux as the regular departure point, will include Bristol or Manchester in England, Gothenburg in Sweden, Copenhagen in Denmark, and other towns in Scandinavia. The next delivery after Dublin, however, is Canada. “The Canadians came to my stand yesterday and they want us to come there in June,” said Albert, speaking at Vinisud, the Montpellier-based wine trade fair for southern France being held this week. “They have already ordered 20,000 bottles, but I think there will be more by the end of the show,” Albert said.